Be a part of Paramount's newest high school! 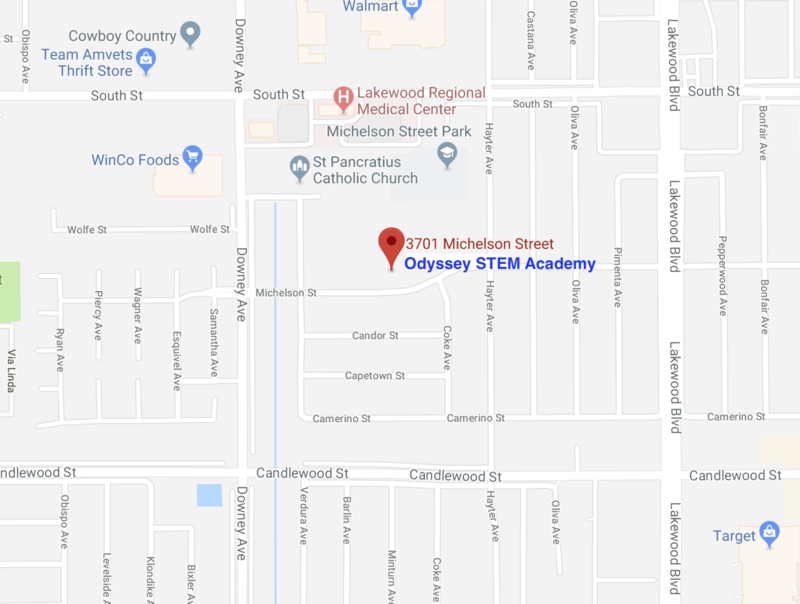 I write to you as the inspired and enthusiastic principal of our community’s newest high school, Odyssey STEM [Science, Technology, Engineering, and Mathematics] Academy. Odyssey will offer the community an exceptional grades 9–12 high school experience for scholars. Opening in August 2018, Odyssey will begin with a founding freshmen class and add an additional grade level each year. The curriculum, based on the National Academy of Engineering Grand Challenges, will engage scholars in society’s most challenging issues such as artificial intelligence, personalized medicine, and urban infrastructure renewal. At Odyssey, we believe that important learning occurs beyond the school walls. As such, all scholars will work side-by-side with industry professionals through an extensive internship program and graduate prepared for success in college, career, and life. Your scholar may choose to attend Odyssey STEM Academy next year. The enclosed materials explain the application process. You are strongly encouraged to attend one of the informational meetings listed in the packet. Should your family decide to enroll, you must complete and submit the application by Friday, January 19, 2018 @ 4:30 pm. I am honored to serve the community and look forward to meeting you soon. For further information, please visit the school’s website at odyssey.pusdschools.net or call my office at (562) 602-8032. Sea parte de la nueva preparatoria de Paramount! Les escribo como el principal inspirado y entusiasta de la nueva preparatoria de nuestra comunidad, Odyssey STEM [Ciencia, Tecnología, Ingeniería y Matemáticas]. Odyssey le ofrecerá a la comunidad una experiencia excepcional para los estudiantes en la preparatoria en los grados 9-12. Se abrira en agosto de 2018, Odyssey comenzará con la nueva clase de noveno grado y cada año agregará un grado adicional. El plan de estudios, basado en la Academia Nacional de Grandes Desafíos de Ingeniería, involucrará a los estudiantes en los temas más desafiantes de la sociedad, como la inteligencia artificial, la medicina personalizada y la renovación de la infraestructura urbana. En Odyssey, creemos que el aprendizaje importante ocurre más allá de los muros de la escuela. Como tal, todos los estudiantes trabajarán lado a lado con profesionales de la industria a través de un extenso programa de prácticas profesionales y se graduarán preparados para tener éxito en la universidad, carrera y la vida. Su estudiante puede elegir asistir a la Academia STEM de Odyssey para el próximo año. Los materiales adjuntos explican el proceso de solicitud. Le recomendamos encarecidamente que asista a una de las reuniones informativas enumeradas en el paquete. Si su familia decide inscribirse, debe completar y presentar la solicitud antes del viernes 19 de enero de 2018 a las 4:30 p.m. Me siento honrado de servir la comunidad y espero verlos pronto. Para obtener más información, visite el sitio web de la escuela en odyssey.pusdschools.net o favor de llamar a mi oficina al (562) 602-8032. Learners engage in authentic work that matters to them and the outside world. They use inquiry to design projects that integrate their minds, hands, and hearts well developing solutions to society’s greatest STEM challenges. Literacy, numeracy, content knowledge and skills are strengthened through connections to meaningful, culturally relevant experiences across all disciplines. Intentional use of technology ignites anytime, anywhere learning. Learners make their thinking visible by curating and sharing their work with authentic audiences. Our community of learners celebrates the uniqueness of each individual and provides equitable access to programs and opportunities while promoting academic and social-emotional well-being for all. Meaningful ties among community members foster a trusting, caring, and mutually respectful culture. Intentionally diverse and integrated learning environments create a community-wide culture of achievement to thrive in a multicultural, global society. Help the Odyssey team support your scholar.